The final musher crossed the finish line in Nome Monday afternoon, ending the 2019 Iditarod Trail Sled Dog Race after 14 days, 22 hours, 51 minutes and 49 seconds. 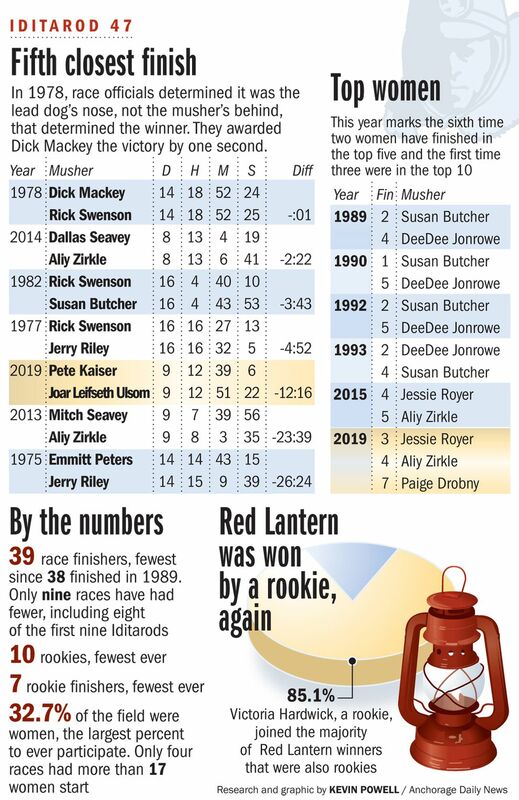 For her last-place finish, Bethel musher Victoria Hardwick, a rookie, won the Red Lantern trophy. 1. A new champion: Bethel’s Pete Kaiser and his eight-dog team won this year’s Iditarod. Kaiser is the first musher of Yup’ik descent to win the race and the first Alaska Native champion since John Baker in 2011. Kaiser, 31, was born and raised in Bethel. He crossed the finish line at 3:39 a.m. Wednesday. It was his 10th Iditarod finish and first victory. He won a new truck and a check for $51,299. 2. A close finish: Kaiser won the Iditarod by just 12 minutes. Defending champion Joar Leifseth Ulsom, 32, and his eight dogs chased Kaiser to the finish line. Forty-two minutes separated the two teams when they left White Mountain, 77 miles from Nome. Leifseth Ulsom gained a lot of ground on the way to the finish line, but not enough to completely close the gap. He took second place at 3:51 a.m. It was the fifth-closest finish between first and second place in the 47-year history of the race. Kaiser’s winning time was 9 days, 12 hours, 39 minutes and 6 seconds. That’s the slowest since 2009. It’s about 39 minutes slower than last year. 3. A trio of top women: Three women placed in the Iditarod’s top 10 for the first time ever. Forty-two-year-old Jessie Royer, who splits her time between Fairbanks and Montana, placed third. Two Rivers musher Aliy Zirkle, 49, placed fourth. Ester musher Paige Drobny, 44, placed seventh. 4. Petit’s race derailed again: For the second year in a row, Girdwood musher Nicolas Petit, 39, commanded the lead for much of the Iditarod and then lost it on the trail out of Shaktoolik, more than three-quarters of the way into the race. 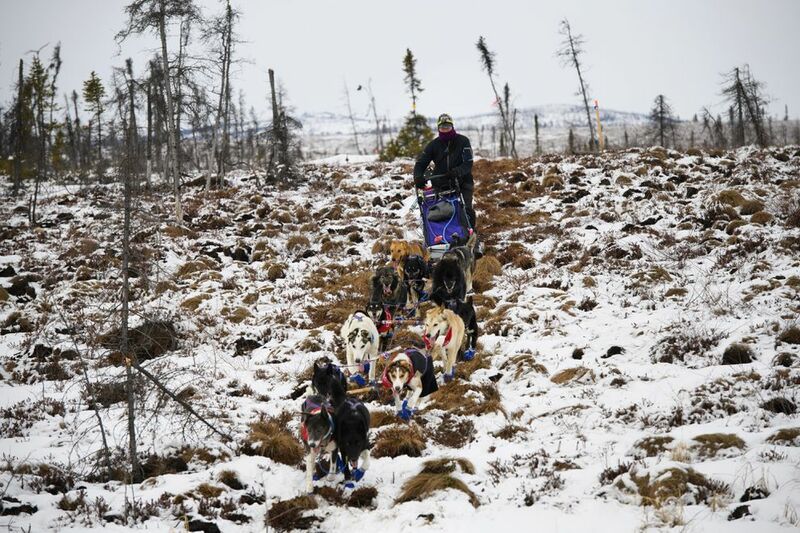 Petit told the Iditarod Insider that his team looked great leaving Shaktoolik. He planned to rest at a cabin on the way to the next checkpoint at Koyuk, but his team stopped short. A dog name named Joee had been picking on one of the younger dogs, Petit said. On the trail out of Shaktoolik, the younger dog stopped to go to the bathroom and Joee tackled it. Petit yelled at Joee. The team refused to continue down the trail and stalled on the sea ice for hours. While stopped on the ice, Petit told the Insider that his dogs were eating and had no orthopedic issues. “It’s just a head thing,” he said. Petit didn’t have his two best lead dogs, Kristy and Libby, to help get the team moving, he recently told the Insider. Leifseth Ulsom tried to help, he said, but it didn’t work. Petit eventually put his dogs in a “fan formation,” he said. He hooked up five dogs side-by-side, put a row of four dogs in front of them and then one dog in lead. Race rules say teams can have no more than two dogs running side-by-side, Petit said, but he needed to get the dogs out of the wind. They went to the cabin and slept. He said he later tried to leave with the dogs in the fan formation, but it didn’t seem like it would work. If they even made it to Koyuk, he said, he expected to receive a penalty or get disqualified for the dog team set-up. “There’s nothing constructive that was going to happen from me going forward,” Petit told the Insider. Petit brought his dogs into the cabin. He decided to call it quits. 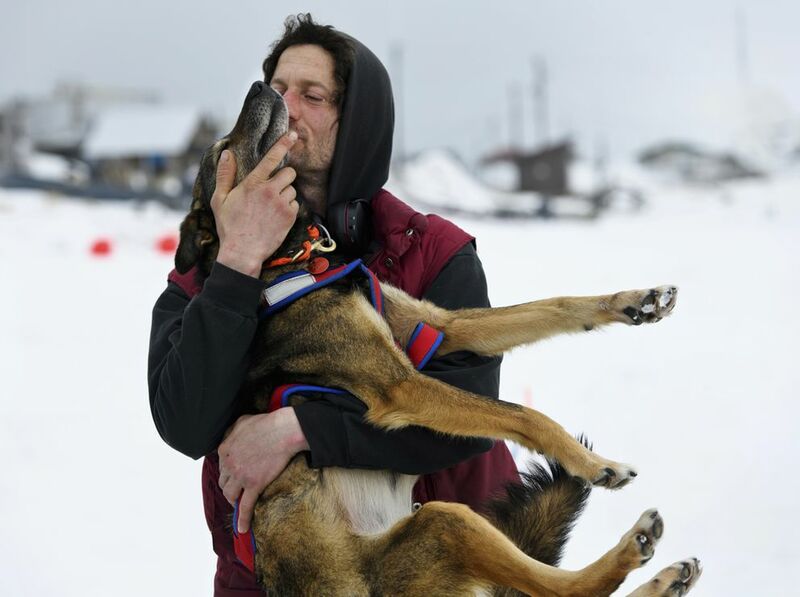 He and his 10 dogs got a ride back to Shaktoolik on a snowmachine and sled, where he officially dropped out of the race, Iditarod officials said. Last year, Petit lost the trail — and his lead — in a storm after leaving Shaktoolik. He said it’s difficult for his dogs to return to that spot. “I can’t blame them for not wanting to go back to a place where their last experience with it was the toughest run of their lives,” Petit told the Insider. Petit placed second in last year’s Iditarod. 5. A tiny race field in two ways: Only 52 mushers started this year’s Iditarod, the smallest race field since 1989 when there were 49 teams. There were also fewer dogs per musher this year. A new race rule limited the size of dog teams to 14, down from 16. Race officials said they were still calculating whether that translated to a lower percentage of dogs sent home from the trail this year. 6. About a quarter of mushers call it quits on the trail: Of the 52 mushers who started this year’s Iditarod, 12 called it quits on the trail, including Petit, and one was withdrawn from the race after his dog died. That means 39 mushers officially finished this year’s Iditarod — 75 percent of those who started it. That’s just below average. Historically, an average of 78.9 percent of Iditarod mushers who start the race reach the finish line. 7. 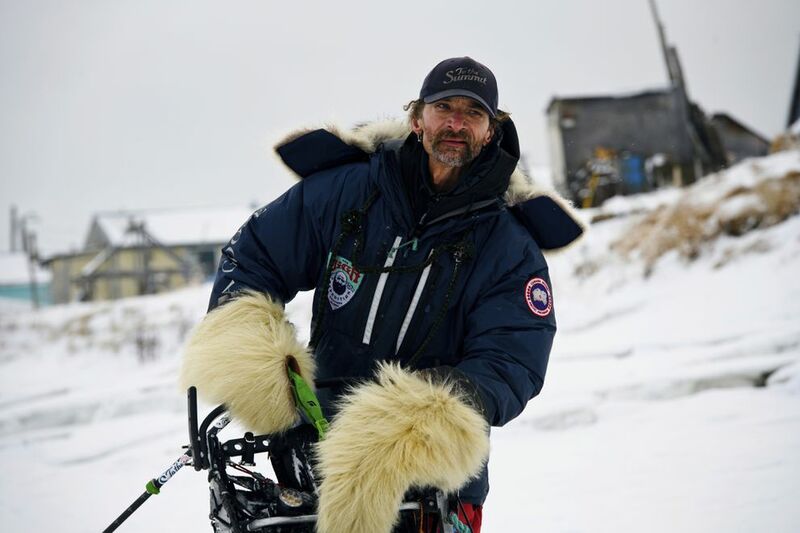 Mackey makes a comeback: Four-time Iditarod champion Lance Mackey crossed the finish line in 26th place Friday, five seconds ahead of Nenana musher Jessie Holmes. Before the race started, Mackey, 48, said he had concerns about his hands. They’re extra susceptible to cold due to radiation and Raynaud’s, which causes the blood vessels to narrow in his fingers in low temperatures. Mackey sat out from the past two Iditarods after disastrous races in 2015 and 2016. Mackey said in an interview Monday that he made it a point to take care of himself on the Iditarod Trail this year. He took his vitamins. He ate healthy. Even in temperatures above freezing, he said, he wore polar bear fur mittens and had four hand warmers in each one. Mackey was named this year’s most inspirational Iditarod musher. He also won that award in 2007 and 2002. “It’s still really mind-blowing to me, I guess, to know that my competitors see me in that way,” Mackey said. Asked if he planned to sign up for the 2020 Iditarod, Mackey noted that his award came with a paid entry for next year’s race. "So I’m going to leave it at that,” he said. Mackey wasn’t the only musher who overcame hurdles before or during the Iditarod. Just a few of the others: Holmes, who placed 27th, had dealt with a broken sled early on in the race. Further down the trail, Willow musher Wade Marrs also had a mangled sled. He borrowed Petit’s sled in Shaktoolik, according to a post on his kennel’s Facebook page. Marrs got to Nome in 14th place. Meanwhile, this was Canadian musher Jason Campeau’s first Iditarod since he suffered a concussion during the 2018 Yukon Quest International Sled Dog Race and was flown from the trail. 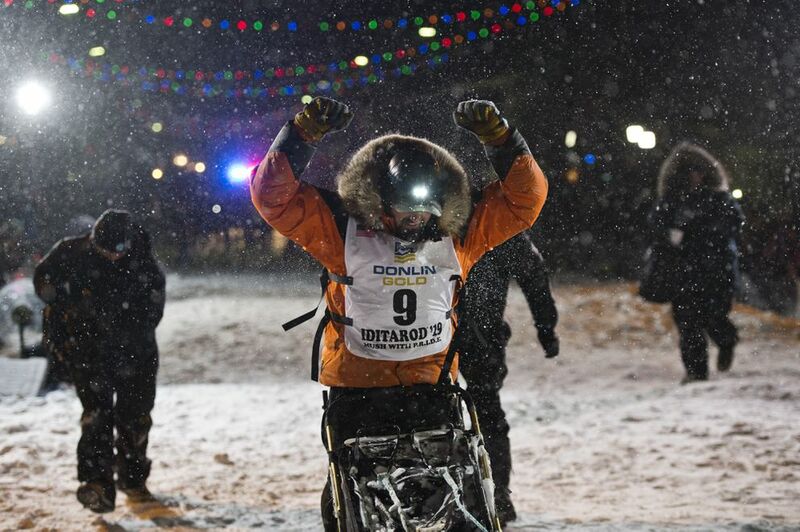 He wore a helmet during tough sections of the Iditarod Trail this year and placed 30th. Talkeetna musher Anja Radano fell into a hole in the ice the Dalzell Gorge, hurting her ribs and her leg. She made it to Nome in 35th place. 8. Warm weather: This year’s Iditarod was also warm. Mushers and their teams dealt with stretches of wet and soggy trail. It rained in Shageluk, a village 487 miles into the race. Chief Iditarod veterinarian Stuart Nelson said in Unalakleet last week that it was the warmest Iditarod he could remember in his 33 years with the race. Rick Thoman, a climate specialist at the University of Alaska Fairbanks, said he didn’t have enough data to say how the temperatures on the trail compared to what mushers experienced in the race’s 47 years. What he could say: As the race progressed, weather stations in communities along the trail didn’t record any temperatures below zero degrees until Sunday evening — with less than 24 hours until the end of the race. Before that, temperatures rarely dropped much below 20 degrees, said Thoman, who also provided updates about weather along the Iditarod Trail this year for the Nome radio station KNOM. This year was the warmest first-place Iditarod finish in Nome since 2005, he said. It was about 21 degrees at the local airport when Kaiser notched his first Iditarod victory. It was also the windiest finish, he said, with a sustained wind at 21 mph. What was your favorite moment of the 2019 Iditarod? Tell us about it in the comment section.